How is YOUR Inner Child today? It is some time since I wrote a blog here as life has thrown some pretty challenging opportunities for growth in my lap lately- the most recent being pretty major cervical spinal surgery (ACDF) to be precise, which meant an incision point in the front of my neck, a fair bit of moving around of muscles so that the top of the spine could be accessed, then shaving away some bone spurs that were compressing my spinal cord followed by removal of a disc which was then replaced by a metal fusion. I was in hospital just a few days and although there is a long recuperation period ahead of me I am in pretty good shape and very grateful for the expertise of the neurosurgeon and his wonderful team who have literally given me the chance of a new beginning in my spinal health. Being the person I am I have naturally looked at the Mind Body link in term of this condition, in the desire to help my spiritual health,knowing that our thoughts and feelings create physical conditions, which if we do not seek to correct whilst they are present in the finer levels of our vibrational field, or Aura we thus have to take notice of when they finally manifest as physical disease.These conditions, although painful if left till this physical stage, are still a gift to us as they provide the opportunity to look at what we have tried to bury or ignore, either from this life time, or carried over from previous lives. Sitting here writing this with a large scar across my neck and metal replacing part of my spine has certainly led me to wondering what I can learn from this about myself as part of my soul growth. Bones are the hard tissue that form the framework to our bodies: the rock on which the temple for our soul is constructed. The spine forms first so this represent the first urge to incarnate in a human body, our ‘primary pattern’. Hard tissue contains inherited characteristics as well as the karmic imprint of past lives now being drawn into this new life. It represents our agreement to be part of life and contains the most condensed form of energy. Hard tissue is also representative of our spiritual energy, which leads us into incarnation in the first place. Developing from the head, where thoughts begin our spine gives spiritual energy to our thoughts and our emotions and reflects who we are. The head forms first in the embryonic stage, closely followed by the spine. This represents the thinking aspect of our development, which motivates the doing centre of our torso and arms and our moving centre as reflected in our pelvis and legs. The doing centre is all about how we feel about things, about what is happening to us and how we respond, whether to draw close or pull away. It is about creativity and expression, of reaching out to others via the heart , or carrying guilt, anger and shouldering burdens. A trauma of some kind in the hard tissue of the bones can reflect a conflict at our deepest core level, so much so that it hinders, and sometimes stops completely our ability to move forward. We cannot go on as before but have to stop, or be stopped. It is a cry for help which provides us with the opportunity to reassess, change direction and begin again. So here I am, digging into my soul to understand what created this condition in the first place- repressed anger? guilt? a refusal to acknowledge feelings or a resistance to commit fully to this life. or are these issues related to past life situations that remained unresolved? This is a work in progress of course, with no easy answers but a need to meditate and reflect and eventually release. A new beginning indeed, and one which we can all make when we listen to our bodies and learn what they are trying to teach us. Hi there! Just wanted to share with you all the great revue The Wigapom Quest has just received from Paradigm Shift Readers Club . QUOTE: ‘What a fantastic read! Not only an exciting fantasy book full of magic, adventure, romance and mystical beings, but also a book filled to the brim with deeper meanings, insights and spiritual concepts. It is such an entertaining book on one level, but on a deeper level it will invite you to go within and look into your own use of thoughts, energy and choice. Thus the Wigapom Quest will be a wonderful fantasy novel to some, it will awaken others to new, spiritual and empowering concepts and it will be a reminder of deeply held inner truths to others. It really is a super review and shows that I set out to do what I intended when I wrote the book- to appeal to everyone on whatever level of spiritual awareness they are on. 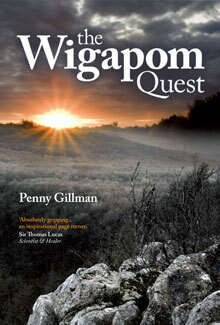 The Wigapom Quest is now available, not only as a paperback, but also an ebook. Read it and see what YOU think! We all come up against our ego at times and that is no bad thing as the Ego is part of our Personality and is thus part of our Higher Self’s choice for this incarnation. It is how the Self sees itself as distinct from the rest of the world and thus involves how we respond or react to situations- whether we can deal with things calmly or whether we allow ourselves to panic, it decides whether we are outgoing or introvert, placid or excitable to name but a view characteristic traits. All of these things make us who we are, or who our Higher Self has decided we need to have experience of. This doesn’t mean that we are not meant to change once incarnated if what we have chosen pre-birth does not help us to grow and develop. It is this need to grow and develop that is, I believe, the challenge of the Ego. Firstly, what do we understand by ego? Without getting too Freudian it’s the part of the personality which includes our defensive , perceptual and intellectual-cognitive functions. Translated from the Latin it means ‘I myself’ and can either reflect an exaggerated sense of self importance or indicate an appropriate sense of pride and self esteem. There seems to be a very fine line between those last two so for the purposes of this article I will use Ego to mean the former – an exaggerated sense of self importance. My own understanding, is that Ego, as I have defined it, is situated in what we know as the Lower Self, in other words the first three chakras. It is essential to our Humanness to have a strong personality, to be grounded (1st Chakra) to have healthy self respect(2nd) and enough self confidence(3rd) to be able to deal with all that Life throws at us. When our Lower Self is strong in this way we are then able to begin the process of developing our Higher Self, (5th,6th and 7th chakras) via the ‘bridge’ of our 4th, the Heart. Then we can begin to transcend the Ego(which on its own is only illusion) and come into who we really are, which is of course Spirit/Soul. We still retain our uniqueness of Self (ie our indvidual talents, likes etc )that we have chosen for this lifetime and that form our personality, but do not allow ourselves to become trapped by them and thus trapped in the ego state. Connecting with our Higher Self allows us to see the Bigger Picture, hear the Wider Message, feel the Unending and unconditional Love. When this happens we can be compassionately detached from the problems and difficulties of life. That is not to say we will not feel the initial pain, or the hurt, but, atleast,we have the higher self ability to transcend it before it becomes corrosive and thus recognise that it was only a small part of the greater whole. Indeed, we can often see the problem as an opportunity or gift for our personal and spiritual growth. Then we have true mastery and see things for what they really are rather than investing them with the illusion of reality. If, however, as often happens we get stuck in our Lower Self ,or Ego state, we feel the intensity of the pain, hurt or rejection continually. It wears away at us like sandpaper on a piece wood, rubbing us raw and thereby increasing the pain , hurt and rejection even more. What was first the wonderful potential gift of spiritual growth becomes instead the hell of needing to defend ourselves continually against the illusory slights and put downs that we feel are being hurled at us. This is when our ego often becomes inflated, as a defence against these hurts and so we remain imprisoned in our self imposed battlement, constantly hurting ourselves by believing that others are hurting us. In truth, no one can hurt us unless we choose to be hurt. Only we have that power but so often we choose to give it away in our projections onto others. To make them responsible instead of ourselves. So, if your ego is telling you that someone has hurt you, or maligned you, or ignored you by doing something, or even not doing something to or for you then perhaps look at the possibility that you are stuck in your Lower Self , believing this is the only place available to you. But there is a wonderful world of the Higher Self just over the Heart Bridge where such hurts cannot and do not exist because in this higher place there is all the Love and all the Recognition and all the Acceptance we could ever want or need. And we have them already. Limitless resources of them. Cascading over us. What are we waiting for! Begin that journey to the Higher Self today and leave Ego behind. Happy travelling! Hello again! It has been a long time since I added a post to my site and since 2012 dawned a lot has happened in my life to challenge me and rock my world. Yet I believe that 2012 is the year for challenge for many of us as we encounter the amazing heightened energies that this special year brings in preparation for Ascension. I will share one of these events with you. I have sat in (and now run) a closed spiritual circle for nearly 20 years now and many messages to this effect have been channelled, certainly in the last 10 years. The messages are still coming and this year has certainly delivered its whammy’s and double whammy’s! No one ever said it was going to be easy being a light worker and by heck, they were right! Even in the healing world I have had my faith in the institution I have supported and worked for shaken to the very core and have been at various times horrified, saddened, shocked, aghast and any number of similar adjectives that you could name. I did not react, however, in the way that I might have done several years ago, by barging in with all guns blazing but knew that I had to respond differently, not from my emotional personality-driven ego but from a higher place of love and I thus stepped back and became an observer as the dramas unfolded before my eyes. I found that this helped me to stay as objective as possible and to recognise that neither ‘side’ or their supporters was wholly ‘right’ or wholly wrong but that in the heat of the moment, when fear and panic and outrage take hold and the moral high ground is sought that even the best can be found wanting. I learnt that it is easy to condemn others yet no one is perfect and that we all need to see the plank in our own eyes before we try to gouge out the splinter in someone else’s. It has reinforced in me that it is human to err and that it is not helpful to judge words and actions made in the heat of the moment. (A hard lesson at times!) It has taught me that we all have to take personal responsibility for our thoughts, words and actions and above all to forgive others for their transgressions in these areas. This is the healing way, the path of unconditional love and the only certain way of understanding and maintaining Oneness. Anything else only leads to separation and takes us further from who we really are. Anger is a human emotion and it has its place but if we cannot move from that anger into understanding and ultimately forgiveness then we remain stuck, either in a place of personal pain, or perhaps even worse, in an anaesthetised no-man’s land with no obvious way out. My own moments of emotional pain over this issue have mercifully found their resolution in eventual inner peace. I cannot deny it has been very challenging, but also rewarding and I hope that, in the wise sentiments of Neale Donald Walsch, I am more than I was before. Resting in peace or beaming me up Scotty? This last week has seen the loss of someone of whom I thought a great deal. He was just 16, talented, vivacious, energetic with a zest for life and living before Leukaemia bit deep and painfully and he lost his fight to this killer disease. To lose him seems such a waste when viewed from the human, lower self level, but I know on a soul level that his time to go had already been chosen and that his soul, or essence, now has other work to do on a more subtle level of energy. There have been thousands of postings on his facebook wall all hoping he is sleeping, or resting in peace and whilst I understand that this is our traditional concept of what happens after death and serves to help many people deal with grief, it is not a concept I share and felt the need to put my own viewpoint on this here. I believe that far from ‘resting’ and ‘sleeping’ for eternity the soul has more work to do on these higher planes, and that the idea of an eternal repose is actually such a waste of energy and therefore, not actually possible. Although I understand that the soul needs a time of initial r & r on passing, especially if energy has been depleted through physical illness, this does not last forever and is a precursor to the next stage of the souls journey, which may involve ‘living’ in another energetic dimension for a while, or helping the progress of others still on the earth plane, or even re-birth in another physical body. This concept is explored at the end of The Wigapom Quest with the death of a leading character. It explores the pain and sadness at his passing of those left behind, but the ultimate joy of recognising that death is not the end but a beginning of a new form of life on the soul level. We are all animated by energy. Energy cannot be destroyed. When the physical casing that houses us in humanity falls away the energy that has animated it is liberated to do other things on other dimensions. And those dimensions are not ‘up there’ or ‘in the sky’- they are not far away at all but exist alongside us, up close and personal, so to speak, but because they now work at a higher, faster vibration, we are not so aware of them as we were when they were restricted by physicality. So there is no RIP, no ‘star’ looking down, although I recognise how that can help others who have been brought up this way. I hope that one day we will all understand and find comfort from this other way of thinking: namely that ‘life’ goes on after ‘death’, (these are mere concepts after all) but to paraphrase Star Trek, not always as we know it. ‘All souls must undergo transmigration…by being born into another body’ states the quote from Jean Paul Richter that begins the first chapter of The Wigapom Quest. This, of course, focuses on the ancient concept Reincarnation, and its constant bedfellow of Karma, that are both Eastern philosophies, now heavily embraced by many in the Western world. Reincarnation has always made total sense to me- if nothing else it is the best form of recycling ever! – and the concept of karma also creates a sense of justice within me- showing that no soul ever ‘gets away with murder’ or indeed any other transgression they may have made in any of the lives they are, or have inhabited. Karma is not just payback though, which would seem to stem from a twisted desire for vengeance rather than fairness, and I personally, do not believe in a vengeful deity but embrace an all loving, compassionate energy source that seeks to encourage us, as individuals souls,( who are all still part of The One’) to accept the full ramifications and responsibilities of our choices in the lives we choose to live and to seek to make our own recompense for them, as a means of learning, not punishment. I believe that the soul creates its own heaven and its own hell and that the latter is not the fire and brimstone hell peopled by devils, demons and other minions of Lucifer but a unique place created by the individual soul, who upon reviewing his previous life with the help of the spiritual elders after death, allow him to recognises his mistakes, transgressions, selfishness, obfuscations and other negative behaviour so that the soul, sadder and wiser now after the event, seeks to redress and rebalance the previous situation by, first, some self reflection (which may be ‘ real hell’ to undergo) and then, when the soul recognises that only it and nothing else can lift it from this space of torment, will decide to release itself from its self imposed hell and return in another body, often with those it has wronged from the past and thus seek to set its karmic record straight. In The Wigapom Quest, I write about our ‘enemies’ on the earth plane as being those souls who love us best of all as they provide the greatest challenges that allow us to grow spiritually and be more than we were before. They gift their own souls for that particular incarnation and thus allow others, often through suffering, to progress further along their own souls pathway and thus transform or transcend their own karmic deeds. Of course, all is just potential, and we each have the choice to learn or ignore our soul lessons, but the gift of karma and reincarnation are always available to offer us that chance again to this time ‘get it right’. How wonderful to know that there are second, third and indeed interminable chances to progress and that the Universe has endless patience with each and every one of us. So the next time someone does or says something unpleasant in your life, treat this as the gift it is, providing you with the opportunity to break the karmic bonds and progress on a spiritual and soul level. When I was a teenager I was always willing the days and weeks to go faster, forever looking forward in time as I impatiently counted off the days so wishfully marked on the back cover of my school General Note Book: striking out each passing one with fervent enthusiasm as each mark brought me closer to being at youth club on Thursdays, round a friends on Fridays, a party or disco on Saturdays with whichever boyfriend was in vogue at the time, and the sociable gang show rehearsals on those magical Sunday afternoons. The other days barely registered with me, being just school and homework filled obstacles to the all important ‘ real life’ I craved, as a junkie craves their next fix. I kept this ‘habit’ up for ages, always looking forward to what had yet to arrive: ticking off my life as I have, in later years, ticked items off a shopping list. When I was young there was always tomorrow, in fact years and years of tomorrows strung themselves like golden lights ahead of me, disappearing into the distance and offering never ending fun experiences in a cloud cuckoo land where I would grow older but never grew old , and things would never really change. Why concern myself with the limits of yesterday or the restrictions of today when tomorrow was never ending? Those halcyon days of course did not last and I find myself now, nearly fifty years further on, wanting to slow down time, to stop the days from passing so quickly, to wring the most out of every fragile, beautiful yet fleeting moment. To enjoy today before it so quickly becomes yesterday and is gone for ever except in my memories. At 16 I could barely contemplate getting old- growing up maybe, but growing old? – never. Yet I am growing old, and there is nothing I can do to stop it. I see it happening each day, with more crows feet and more grey hairs staring at me from the mirror, more stiff and aching joints despite my gym classes and glucosamine doing their best to keep them at bay. I don’t want to tick off days anymore, but it’s still happening, like some robotic monster that having started up I now can’t turn off. I want to hold back the years, to yell to old Cronos to slow down a bit so that I don’t have to slow down so fast. Unfortunately he too is as old as time and obviously deaf. There are positive things of course about getting older- heck, there has to be doesn’t there, otherwise we’d all put our heads in the gas oven on reaching thirty! I have a wonderful grown up family and delight in being a grandmother, but oh dear, even that makes me sound so old. Yet how can I be old when in my head at least I’m still young? There is so much still I want to do, to experience, to feel, to say, to sing, to appreciate and I’ll make sure I get to do as much of it as I can, but now, as I climb the proverbial hill a bit more, I can see that the view is definitely finite and so I am having to live with that previously ignored reality and make the best of every moment before they run out. I want that to be a long time in the future, yet the prospect of ageing is not a comfortable one to contemplate and I find I’m on an emotional treadmill that is harder work getting to grips with than any found at the gym. Now, I know that my thoughts create my reality, at least my thoughts create how I perceive my situation, yet I also know that I can’t think myself 16 again and that I will one day throw off this mortal coil. I really do believe that death is only a new beginning but I love life so much and the special people in it that ‘losing’ them, even for paradise is a sobering thought, especially if the run up to paradise means increasing wobbly bits and, worse, losing even the memories of yesterday, or the possibilities of tomorrow if dementia should strike. That really would mean only inhabiting just the now. Umm, food for thought there! Oh what a difference the sum makes to the way we feel- at least, the way I feel. When it shines, there is no mountain I feel I couldn’t climb, no river I feel I couldn’t cross, no task I couldn’t accomplish. It brings out the best in me especially positivity to my soul as well as warmth to the all important extremities and as far as I’m concerned it can stay right here till next year. Well, the books and I were certainly on the stand, if not Wigapom himself, and there was plenty of synchronicity about that day. I had a really delightful time chatting to loads of people about The Wigapom Quest and met up with some colleagues from the fairly distant past. We swapped our recent life histories and amazed ourselves how our paths had crossed and recrossed, met strangers that turned out not to be strangers but who were drawn to my stand: amazing coincidences, some might say, but we knew it was Universal synchronicity working behind the scenes. One lady who felt drawn to visit my stall, although she didnt know why, chatted about my book, and her spiritual path. It turned out she wrote too, and painted- and that she lived just up the road from me, yet we had never met before, yet she knew not only my Mum (another painter) via a shared art class, but also Valerie, who did the second review on the cover of my book. She, along with a number of others, bought a copy. I was really delighted to sign it. A small world in deed! Just finished reading ‘The Wigapom Quest’ and find myself somewhat saddened that I had to leave the story and characters behind! Have felt part of the story and totally absorbed by all the twists and turns of the tale. Initially was a little concerned that I could draw some comparisons with Lord of the Rings; for example, Magus/Gandalf, Darq’on/Sauron, Roth Riders/Ring Wraiths,Fynn/Sam, Forbidden wood/Fangorn, but as I moved on through the story, it really began to develop and grow in it’s own right. Beautifully written, with the most wonderful descriptive language that conjures up such visually spectacular images. Lots of learning for the individual’s soul and spirit and truly an inspirational text. Would make a wonderful film….particularly if Peter Jackson directed it!